Road Tripping Norway's Famous Fjords — Sapphire & Elm Travel Co.
Norway had been on my travel bucket list for years for many reasons; it's charming and picturesque seaside mountain villages, untouched and dramatic nature, hiking through the unparalleled fjords, among other things. I decided to travel to Norway earlier this year to visit a friend living in Bergen, to hike Preikestolen (Pulpit Rock), to see Oslo and stay at the famous Thief Hotel. But perhaps at the top of my list was to see the fjords. More specifically, to road trip the west coast of Norway through the fjords, particularly to see both Geirangerfjord and Sognefjord. FUN FACT: Scoresby Sund in Greenland is the longest fjord in the world at 350 km (217 mi). Greely Fiord/Tanquary Fiord in Canada is the second longest fjord in the world at 230 km (143 mi). Geirgangerfjord is considered the most beautiful fjord in the world and since 2005 has had UNESCO World Heritage Status. We rented a car at around 9am one morning in Bergen and we left for the fjords of Norway. We had two days to drive 800km (500 miles), which was estimated to take us 16 hours by car. It sounds like a lot to most people but being from California, driving 500 miles in one day isn’t so unusual. In fact, I often drove it from San Diego to Sacramento 4 times per year! So my good friend and I (both from California) didn’t even flinch at the estimated time! 16 hours road tripping the west coast of Norway, gazing out on the stunning mountains, lakes, rivers, fjords, and houses. No problem. This is what we came for. 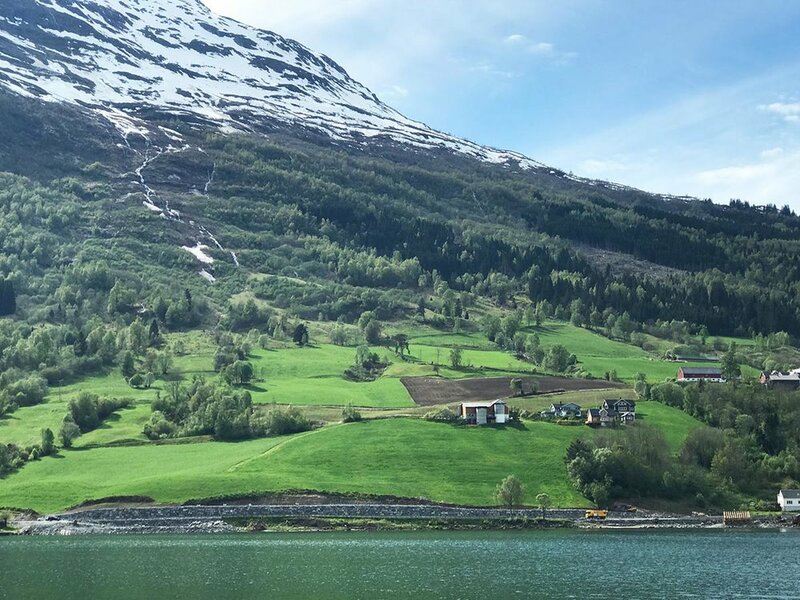 It was recommended to us by some locals that we take an indirect route to Geiranger, along the eastern side, then heading back to Bergen we could take a different route closer to the western edge of the country. We checked online to see if the roads were open, because in snowy places like Norway or Glacier National Park, Montana, once they open roads they’re open all summer long. The alternate route was open! We were thrilled! This route meant we were going to see a lot more of the country. Which is exactly what we wanted, even if that meant a few extra hours in the car. This route would take us through Voss, Tvindefossen waterfall in Skulestadmo which was an INCREDIBLE surprise, Nærøyfjord, Flåm, Aurlandsvangen, Øvre Årdal, Grotli which is a tiny village that’s mostly abandoned except for a couple hotels and a market. Sognefjorden’s most narrow and famous fjord arm is the Nærøyfjord, only 250m wide at its narrowest. Since 2005, Nærøyfjorden has been listed as a UNESCO World Heritage Site. We past the most quaint little towns and homes complete with green roofs in Tessanden. Then we started to pass snow and ice, and lots of it. Which should have been an indicator of what was to come. It’s here in Grotli that we ran into a problem. A big problem. The road where we turned off of the 15 and onto the 63 was closed. Only 24 km (15 MILES) to go until we were in Geiranger. And the road was closed, covered in so much snow that you could no longer see where the road was. It was 8:30pm. We had been in the car almost 12 hours. Granted we stopped a lot to get out of the car, walk around and take pictures. But we were so close! It should have only been a 40-minute drive from here. After a brief moment of panic that we’d be sleeping in the car in the snow as we didn't have telephone service to re-route us, followed by a laugh at the absurdity of the situation (as we checked two sources about this exact road), we had no choice but to continue on a different route. This detour was a 100km (60 miles) through Stryn to Hellesylt. Two more hours. We could do it. Back down the mountain we go. Really not mad about the detour. We stopped in Stryn for dinner of kebabs in the most picturesque town around 9:30pm. Back on the road, we arrived in Hellesylt just before midnight. Checked into a hotel, thank goodness they were still open at 11:30pm. One of the very nice things about road tripping Norway in the summer is the daylight hours. Sunset around 10pm, but it wasn’t dark until 11ish. So we still had excellent views while driving. After all, we did want to see more of Norway so the detour actually helped us see more towns and more life here in the country. A blessing in disguise really. The next morning we awoke to take the first ferry from Hellesylt to Geirangerfjord at 9:30am. It’s a 1 hour ferry ride, and it cost us $95 for 2 people and 1 vehicle. The big downside here is that we weren’t planning on taking the ferry twice. We were expecting to only take it from Geirangerfjord to Hellesylt to road trip back to Bergen. Now, we had to take it from Hellesylt to Geirangerfjord and back. In the grand scheme of downsides, this wasn’t terrible. The ferry from Hellesylt to Geirangerfjord is, for lack of better words, epic. Close your eyes and picture what you think a boat ride through a fjord would look like. It’s better. Infinitely better than what you can imagine. Breathtaking being surrounding by shear grandeur. You can feel the weight of the mountains, the life of the water below you. It’s a one-hour boat ride of pure magic. Once we arrived in Geiranger, we took the car up to the viewpoint. You can take a bus, rent electric cars, or bike up but because we had the car we drove. The viewpoint offers some seriously stunning views over the fjord. From here you can see the scale of the mountains and canyon. I mean the cruise ships look like toys! After soaking it all up, we headed back towards town, parked the car and walked around. We wandered and found another waterfall in which we were the only 2 people here to enjoy. Then we headed towards the waterfall path nearest the hotel and walked down to the bottom, then back up. Such a powerful waterfall. After this we grabbed a bite to eat and some coffee then hopped back on the 1pm ferry to Hellesylt. After all, we had to drive back to Bergen. We were catching the train to Oslo the next morning. We had about 2.5 hours in Geiranger town and we felt like we had seen it. The second ferry ride was just as incredible. We stood outside the whole time, soaking in the fjord. Back in Hellesylt, we drove straight through to Bergen, this time on the direct route. Just pure magic looking out of the windows of the car. Everywhere you look the mountain, houses, towns, water was just awe inspiring. We realized about an hour outside of Bergen that we hadn’t turned music or a podcast on all day. The scenery was that mesmerizing. We arrived back in Bergen around 8:30pm. Dropped off the rental car and went for a beer at Henrik øl og Vinstove and sat outside on their roof. Then went for dinner of kebabs, of course. Even with the 2.5 hour delay it was a perfect two day road trip through the fjords of Norway. Is road tripping the Fjords of Western Norway on your travel bucket list? If it isn’t, it should be. It’s one of the most beautiful countries I have ever seen in my life. Expensive, yes but oh so worth it. And keep in mind I had just quit my job 4 months earlier and had been traveling full time since then, and even I made a trip to Norway work! There is so much to see and do in Norway. Contact Us to plan your trip so you can enjoy a unique, custom, and stress free vacation!